Bhel and Pani puri, anyone? Mention bhel and chaat dishes to me anytime of the day or night and my mouth starts watering. So in my book, the bhel cart picture had to be framed! I clicked this picture early afternoon as the bhel and pani puri cart owners were getting ready for the evening. The carts would be so mobbed in the evenings that I would not have been able to get a picture of the carts. Bhel is one of the most popular street foods in India. I hope that you enjoyed the pictures of’ ‘breakfast’ foods at the Street Food Festival in my last post. 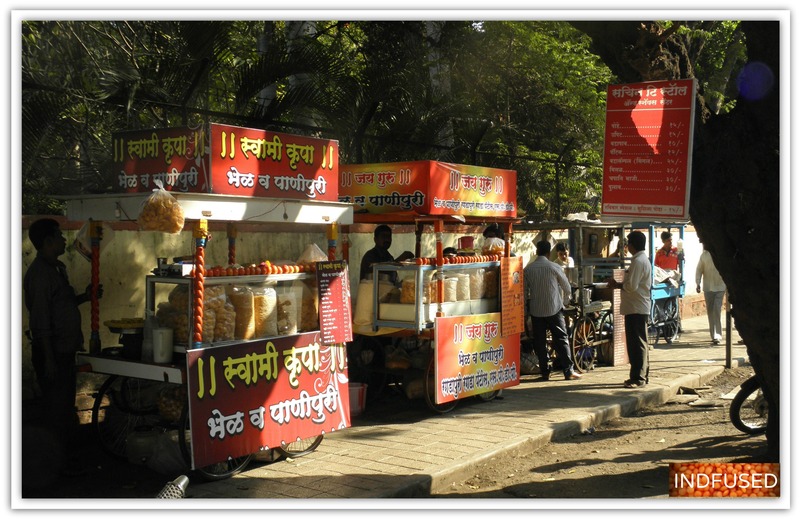 There is such a wide variety of foods at the street carts that it is hard to pick and choose which ones to showcase. But I will try and share pictures of some other popular food carts here. I hope you enjoy a tour of the Khau Galli! I hope you get a chance to enjoy a great food festival this weekend too! Vada Paav and Sandwich Pakora! Pizza cooked on a huge skillet called Tawa on top of a coal fired stove. My favorite – Fresh sugarcane juice with ginger! Yum! Paan- stuffed betel nut leaves to finish a meal.